A blog about spirituality, writing, and living a contemplative life. Do you have a favorite time of day? Maybe it’s looking forward to that first sip of coffee in the morning. Maybe it’s listening to your favorite song or podcast on the way home from work. I have a few favorite times. One time is at the end of my day, maybe around 11:30 pm. 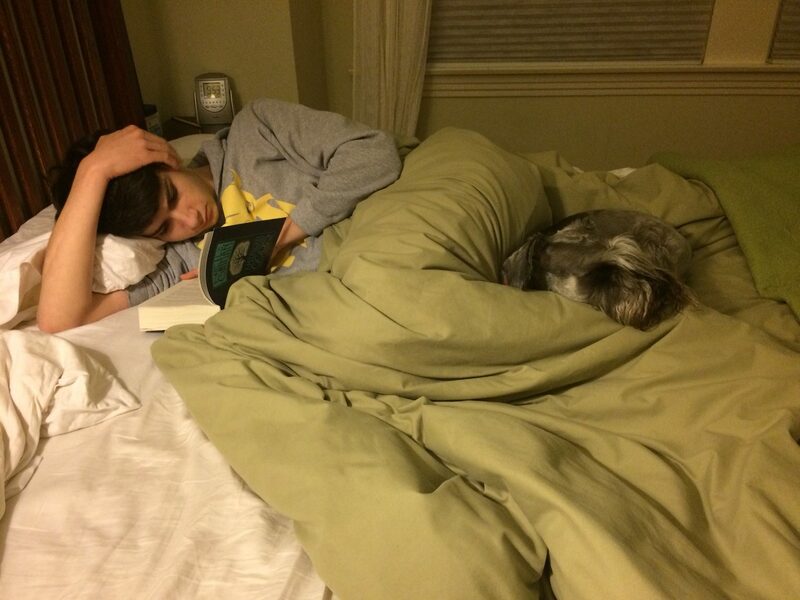 That’s when I’m usually in bed, journal or book in hand, my Schnauzer cuddled up next to me. It’s also when my younger son TJ joins me, ostensibly to cuddle with the dog for a few minutes, but also for a little mom time and a back rub. Not so many years ago TJ was a little boy and I would tuck him in his bed among his stuffed animals after reading to him. As he approached adolescence I knew those days were numbered and I became wistful that he’d no longer want that nighttime ritual. A few years later I did stop reading to TJ and instead he and his older brother Miguel simply chatted with each other as they fell asleep. Then, Miguel left for college and TJ felt alone in his big room. That’s when he started coming to me to hang out for a while before bedtime. Mostly, our conversations revolve around the dog. Where is Romeo’s favorite place to be scratched? Is he putting on some weight? What does he dream about? In between, I read a few pages of a book and TJ looks at Reddit on his laptop. Every so often I’ll glance over in amazement at TJ’s lanky six-foot frame stretched out next to me. How did my little boy grow into this big man? Eventually, if TJ stays a long time, my husband will come in and kick him out. But he’s reluctant to interrupt our time together. I thought of all this recently as I learned in my spiritual direction program the importance of engaging mind and body in spiritual practices. The times of hanging out with TJ before bedtime, being close physically and mentally, are almost spiritual experiences. It feels like time stops for a while. I get a sense of the transcendent in everyday life. At my spiritual direction group this week one of the facilitators started our meeting by reminding us that it was holy week, the most important week of the Christian year. She asked us to pray holding our palms open and facing up, as a physical symbol of letting go of those things that were weighing on us. I thought of the many worries on my mind and the things I wanted to resolve. Then I thought of Jesus’ life. He only lived 33 years and, from a human perspective, that seems short. Think of how many more miracles he could have performed or sermons he could have given had he lived longer! Yet he lived a perfect life. As I sat in prayer, with my hands open, I asked God to release my striving to complete and resolve so many things. Our meeting continued on for several more hours, but that moment, with my palms turned up, was the most transcendent. Lent and Easter can be a good time to remember the mind-body-spirit connection. For Lent we often give up something physical, like a certain food, to focus on the holy. This year, instead of giving something up, I added something healthy. A friend challenged me to walk to church instead of driving. Since the walk is only about 10 minutes, this wasn’t difficult. I just had to remember to give myself an extra 10 minutes to get to church. The extra walking felt good. I didn’t exactly pray during the walks but I found myself in a state of gratitude as I admired the neighbors’ blooming daffodils and tulip trees. I always paused at a small creek where I could hear the spring rains running by, down to the bay. One morning I saw a family of deer cross the street. I arrived at church on Sundays in a more contented, relaxed state. This is one Lenten practice I’ll hope to keep. Last night I participated in our Maundy Thursday service, which culminated in a powerful mind-body-spirit experience—washing each other’s feet. We did this to commemorate Jesus’ last supper with his disciples, when he washed their feet to show his love toward them. I’ll admit I was a bit hesitant to wash another person’s feet and get my feet washed in return. My partner and I let a family with two small children go ahead of us in line. Surprisingly, or maybe not, the young children were eager to participate. They each had a turn in the chair, dangling their legs above the water bowl and eagerly leaning forward to get their feet washed. When that was done, they cried out, “I want to wash your feet Mommy! Can I do it, please!” It reminded me that kids aren’t self-conscious about their bodies. They can enter into an experience in a way adults often can’t—or can only through some effort. I wanted to be a bit more like those kids. Today is Good Friday and I will once again go to church. It will be a somber service. The sanctuary will be dark except for a few candles that will be gradually snuffed out. At the end of the service we will take turns holding a heavy hammer and pounding nails into a large wooden cross. The sound of pounding will ring in my head for hours afterwards. I will remember Jesus’ short and perfect life. I will experience his suffering and death in a tiny way through the sights and sounds of the service. I would rather skip over this part of the story but I realize darkness and pain are part of our reality. I will attend this service, if not out of desire, then out of obedience to the truth of the whole story. And fortunately today isn’t the end of the story. What will I remember of this Easter season? I may remember that this was a time when I saw more clearly the integration of mind, body and spirit. I will be thankful that I have many teachers of this lesson—my son, my spiritual direction group, friends and friends’ children. I will commit to living not just in one dimension, but in all my wholeness, slanting toward joy. This entry was posted in family, holidays, Spirituality and tagged Easter, mind-body connection, spirituality, Thomas Merton by Allison. Bookmark the permalink.